The apartment is located in the village center of Habaraduwa behind an ancient, huge cantilevered bodhi tree (ficus religiosa). 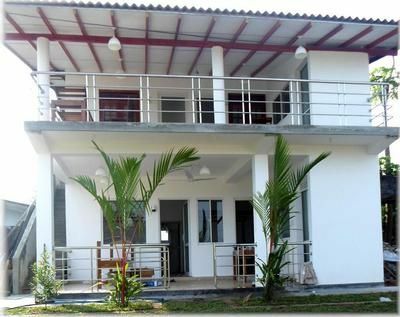 It is located in the second building-series on the Colombo-Matara-Road, which runs along the west coast, right on the beach of the Indian Ocean. Entirely renovated in February 2014 the apartment has 2 separate double rooms with en-suite bathrooms, a shared kitchen and a large covered terrace with sea view. The rooms and the dining terrace is equipped with high quality hand made teak furniture. The king size beds have good, comfortable mattresses, bed canopy and mosquito nets. Each room is equipped with air conditioning and ceiling fan. The two rooms have a separate entrance each, they can also be booked individually. Directly on the long golden beach are huts and treatment rooms for massages. In the garden with outdoor furniture you can relax under palm trees. Restaurants, bakeries, fast food restaurant with takeaway and delivery service, all kinds of shops, pharmacy, emergency physician, banks, post office, internet cafe, train and bus stations are "around the corner".